Gas Analyzer Albuquerque | CIC Photonics, Inc.
CIC Photonics is a leading producer of gas analysis systems for environmental, semiconductor, and industrial applications. We are a globally recognized manufacturer of high-quality analytical instrumentation, sampling systems and accessories. Our team of chemists and engineers have created Integrated Real-Time Gas Analysis Solutions (IRGAS) technology that can be used in a number of industrial gas analysis applications. This innovative solution was the original analytical instrument for parts-per-billion detection of electronic specialty gas impurities and is now used in applications across diverse industries. Semi-Gas Analysis for semiconductor equipment manufacturers, designed to meet moisture content purity requirements and successfully monitor the removal of unwanted contaminants of epitaxial treatment gases. Solar Photovoltaics Gas Analysis for solar technology production, with an available dual gas cell system to provide both percentage and high-level ppb limits of detection for solar processed gases. Specialty Gas Analysis for commercial, research, and governmental agencies that determine levels of composition and purity measurements for multiple gas species. 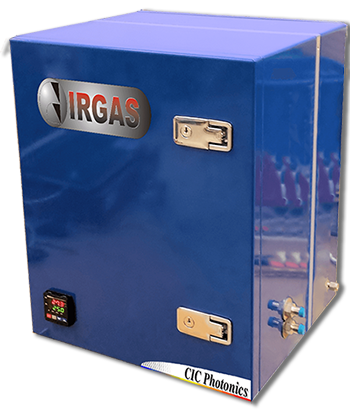 IRGAS systems can also provide solutions to monitor pollutant emissions, combustion efficiency, and the decontamination of hazardous chemical and biological agents. Fitted with a Specialty Gas Analysis Solution (SPGAS) software system, CIC Photonics’ turnkey IRGAS systems can meet the chemical analysis needs of manufacturers in any industry. CIC Photonics is committed to delivering the highest quality FTIR gas analysis systems and cells. Over the decades, our IRGAS systems have evolved to provide one-of-a-kind solutions to hundreds of clients around the world. CICP Solutions are compatible with all FTIR Spectrometers and offer a low lifecycle cost with longer cell life. Call CIC Photonics today and discover why our uniquely designed IRGAS gas analyzer is one of the top-performing tools in the field.